"Nasty Toys for Naughty Children Series" is part of a larger project called "Dime Store Dollies" where I take cheap dollar store dolls, which are quick discarded by children, or dolls from Charity Shops, which have already been discarded and turn them into something that is strangely beautiful. Nasty Toys for naught Children is the darker side of this project, dealing with all the things that "Go bump in the Night!" Many people have an innate fear of dolls, so moving them past the realm of just creepy by accident I try & create the "Creepy cute" feeling that makes the viewer go " Awe thatâ€™s...wait what???" 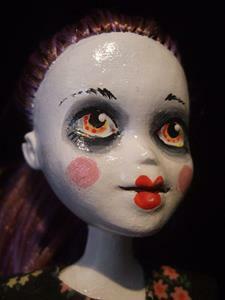 Only dolls that have already been discarded or disposable dollar store dolls are used in this project. 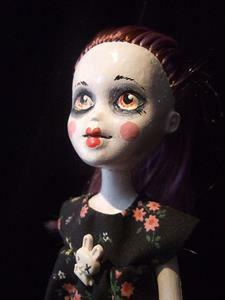 I work only with dolls that are in great need of help! Each doll is primed and then hand painted with artistâ€™s acrylics. 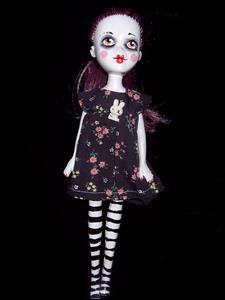 No two dolls are ever exactly alike, even if the basic theme is repeated.